Many of us when new to the koi hobby are attracted by those “sparkly” little koi that seem to be covered with diamonds. These are known as “ginrin” koi. 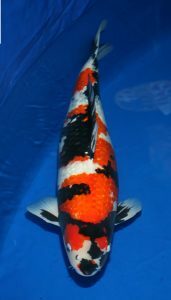 GinRin is not a variety per se, but a characteristic that can be seen on any scaled koi. The Japanese pronunciation sounds like “geenleen”, but it has been Americanized by most to sound just like it looks, with a hard ‘G’. It translates to “silver scale”, and is sometimes referred to as “KinGinRin”, or “Gold and silver scale”. This is because, when ginrin appears on a red fish such as a kohaku, it sometimes has a gold appearance. This silver effect is due to the presence in the scale of a chromatophore called guanine, which was first noticed in a random spawning in Japan in 1929. There are actually four distinct types of GinRin scales. The most common is known as “diamond gin”, and appears much like cracked glass over the entire scale. A highly valued type, and hard to find in this country, is called “Beta Gin”, which is characterized by the entire scale being covered with silver, much like a mirror. A third type is “kada gin”, or “edge gin”, which is exactly as it sounds – each scale is edged in silver. The last, and by far rarest, is pearl gin. On this type, the gin appears only in the center of the scale, and truly looks as though someone carefully mounted a diamond on each scale. When selecting a young ginrin koi, look for those with at least three rows of ginrin scales on either side of the dorsal fin. These scales should be evenly lined up in neat rows and of consistent shine. I can remember when I was new to the hobby and looking at a young ginrin with jumbled ginrin scales. The dealer told me not to worry, that they will line up as the fish grows. Didn’t happen, and never will!